For once, the ads did not exaggerate. Jeff Probst's "Wow, I've never seen anything like it" was a pretty accurate summation of the Tribal Council shenanigans. Survivor finally had what had to be a truly "live" Tribal Council, and it was a spectacle to behold. Clusters of huddling contestants, negotiating frantically, splitting apart, then rejoining in different combinations. Whispers, assertions, offhand insults, all delightfully gasped at and appreciated by the five-member jury. It was weird, it was unprecedented, and it was fun. Amidst all the chaos, some broader themes and strokes emerged. Rick and Julie, both excluded from the previous episode's coup against the Kama Strong-, Loved Ones-touting Eric, separately seized the moment and drove the strategy to topple one of the leaders of the last vote, Julia. Rick by vocally driving home the previous episode's division and openly wondering why Julie and Ron didn't just join up with the Lesus and re-seize power. Julie by publicly proclaiming "I'm out" on Kama, and literally jumping into the laps of the Lesus (well, David's at least). Julie's unwavering departure made it impossible for the Kamas to muster the numbers to dictate the vote's outcome, so long as the five Lesus stuck together. And for once, despite all the whispering and assurances from their newfound alleged allies, they did! With Julie as his co-pilot, Rick flew the previously undermanned airship Lesu up and out of the swirl of sharks and minnows (and poop), and on into a now-even 5-5 original tribe split. 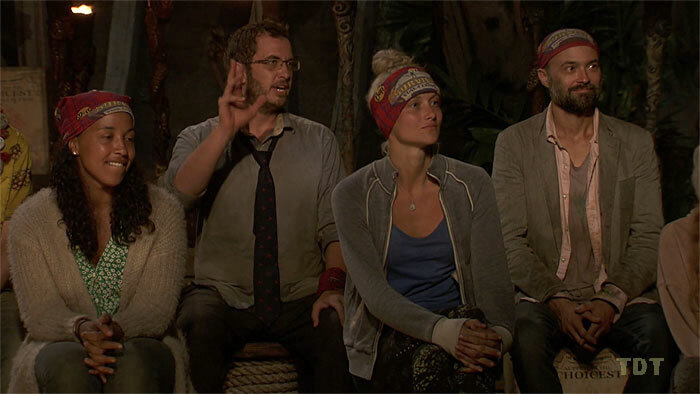 It's the same return to parity we saw last season after David vs. Goliath's Episode 9 Tribal Council, except minus all the vote steals and idol nullifiers. Just pure, basic Survivor strategy: The people on the bottom uniting to oust the people on top. Is this a permanent power shift? Probably not. Just as in David vs. Goliath, the former underdog Lesus are still not really together, especially since there's a strong trio (Kelley, Lauren, Wardog) whose closeness (and array of weapons, in the form of idols) limits the potential of the other two (David and Rick). Maybe that duo can work some magic with their cross-tribal allies (Julie and Ron). More likely, though, is another re-shuffling and reversal of fortune for someone. Maybe the game devolves to original tribal lines, at which point Aurora breaks out her extra vote, and the Lesu boat capsizes again. 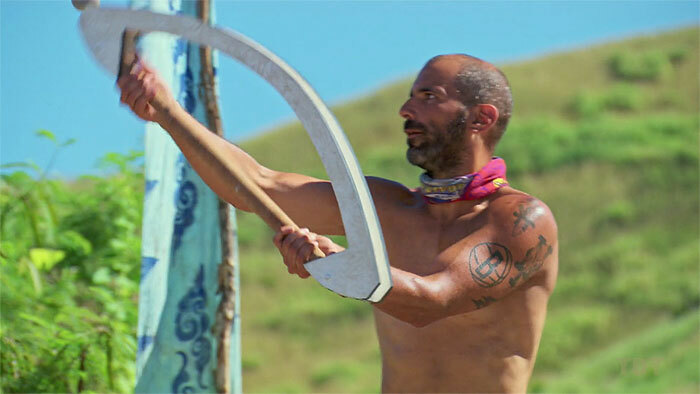 For the moment, though, despite the season-long focus on the twist whose name is on everyone's buffs, the good old, regular Survivor part of the show has suddenly become a lot more interesting. These people are playing, and it's fun to watch. A one-day episode? How did this happen? *Raises hand* Hey, finally an actual use for this season's Calendar, and those of seasons past! Nothing is ever clear in Survivor, but looking back at past Redemption Island seasons (yes, yes, this is an entirely new concept with no structural relationship whatsoever to Redemption Island), this spot has always been used for a double boot episode: Episode 9 in Redemption Island — Final 11 IC/Tribal on Day 22, followed by Final 10 IC/Tribal two days later. Episode 9 in South Pacific — F11 IC/Tribal on Day 22, followed by F10 IC/Tribal two days later. Episode 9 in Blood vs. Water — F10 IC/Tribal on Day 22, followed by F9 IC/Tribal two days later (Colton's quit reduced the numbers left by one). You're probably sensing a pattern, right? Most likely this episode was supposed to be the first day of a double-boot episode. The F11 IC and Tribal on Day 23 were intended to be followed by the F10 IC/Tribal two days later, on Day 25. But as Jeff Probst remarked, there was clearly a lot going on at Tribal. Editing that all down to a single half-hour (or less, since there's likely a planned advantage popping up on Edge of Extinction on Day 24) would have been almost impossible, and would likewise have been a massive loss for the audience. It's unclear how the slack will be taken up by the following episodes. From the first preview of Episode 10, it appears that instead of trying to cram in a separate reward challenge between the two immunity/Tribal sequences, they just repurposed the reward, and turned the first immunity challenge into a combined reward/immunity challenge. If so, good calls all around. It's great to see Survivor taking stock of what they have on film in real time, adjusting on the fly, and trying new things. In this case, they made the bold move to spin off an entertaining one-day stretch into a freestanding episode. There may be (almost certainly will be, see the section below) other choices that are less desirable, but let's acknowledge a production win when we see it. Since people have started showing up regularly at Edge of Extinction, the storytelling there has fallen into a rut. We're given a montage of the recent arrival staring blankly into the distance, thinking they maybe want to raise the sail, but eventually vowing to keep pushing on. That's nice, and it shows admirable determination, but the ritual aspect of this has really started to minimize the isolation and reflection of Extinction. These people were voted out! Their game is most likely already over. At the very least, they're shifting to jury phase, in an extremely low-budget Ponderosa. And yet we're getting almost no discussion of or reflection on the game itself. Instead, we see rote repetition of "Wow, it's really hard to stay here." The main problem with this? It's telling, not showing. Also, ever since the travails of Extinction were first shown in the early days with Reem, every subsequent attempt to demonstrate it (since Chris arrived, at least) has gradually undercut the spartan setting. For every generic new arrival looking wistfully at the mast in a staged close-up, the rest of the footage has been pretty much Survivor-lite: scenes of Chris bringing home a feast of fish, or of everyone racing around, hunting for advantages. The main ingredient that's missing, always: actual Survivor. You know, the version currently dividing and re-shuffling those other 10 people over on Vata beach. This is strange, because these (nearly) ex-contestants, especially the newest visitors, almost certainly are stewing over the game and their departure from it, and mulling their determination to re-enter. We saw substantially more of that in the web-only Ponderosa videos in seasons past. Here it's almost never mentioned, except maybe when production's avalanche of advantages forces it to be, like when someone wins a re-entry challenge advantage. The actual Survivor game that's proceeding without them is pretty much an afterthought, or at best an abstract concept with which they hope to reunite. There are no pledges of revenge, no visible attempts at jury management, nothing ... even though one of these people might go back in the game eventually, and the others will all be jurors. Shouldn't they be a little interested in what's going on, given that they're going to award someone a million bucks in just over 14 days? It's as if the Edge is supposed to be a conscious rejection of the strategic game. But that part of the show is what made the half-hour Tribal Council so interesting! This site-specific Survivor-avoidance is frustrating, because even the Edge of Extinction-originated narrative threads seem to come here to die. 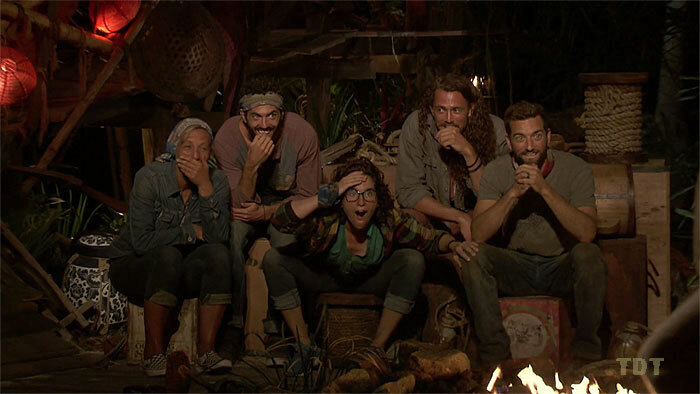 When Rick found the extra vote advantage and sent it back into the game to Aubry, we never heard his thoughts on the gift — somewhat understandable, to keep the recipient a surprise ... fine. But after that, when Aubry showed up at Edge of Extinction the very next day, there was no mention of the gift. Was Rick disappointed his effort failed? Was Aubry curious as to who sent it? Did they bond over their secret (?) connection? Who knows! Did we ever see Aubry talk to Rick, even as part of the group? Nope! 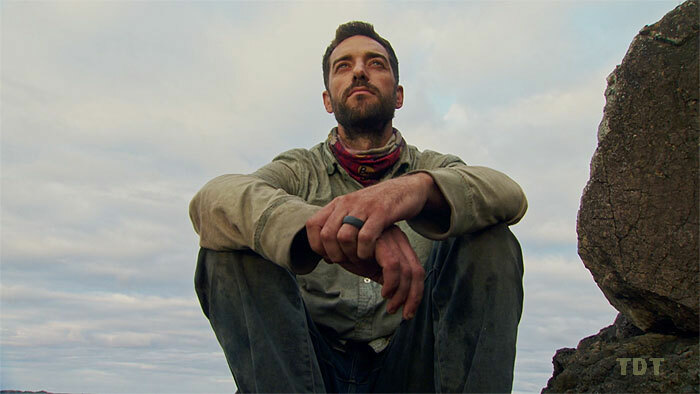 Now Eric has washed up on the Edge's shores, and as an alleged co-leader of Kama (at least as was implied in his boot episode), he was instrumental in voting out both Joe and Aubry. Remember Joe and Aubry, whose games were hobbled from Day 1 because they were returning players, and how we spent the first four episodes worrying about how the other Kamas all wanted to vote them out? Oh, what fun times those were. They're still there, too! Well, anyway, here's one of those evil first-time players who actually made good on that threat. Maybe we should clear the air. Let's f***ing do it! But no ... instead of letting Eric, Aubry, or Joe discuss that, let's ... go with Eric staring at the sunrise, from multiple angles. Ooh, scenic. And pensive! Or wait, here's Eric admiring Chris's stingray catch. Very squirmy. Hold up, here's a scene where Eric, Joe, and Aubry are finally all together, talking. Yes! And they're discussing ... not raising the sail. Anything but the Game that Must Not be Named! Whew. - Subtle theme consistency: Everyone's constant attempts to adjust and stop a moving ball from falling off the bow in the IC was a fun visual metaphor for all the back-and-forth alliance flipping that was later to come at Tribal, before everything finally fell in the dirt, and one name remained. - Speaking of challenges, the positive: Gavin had a point when he argued that David is turning into a challenge beast. David has now finished 4th, 4th, and 2nd across the first three individual ICs. That's good for an 80.9% mean % finish, and lifts his career mark up to 65.3%. That's pretty good: Solid enough for 15th place all-time (among people who have appeared in at least two individual challenges in at least two seasons). If he can maintain that pace, an 80.9% MPF would also be 15th-best ever in a single season, ahead of one Joe Anglim in Cambodia. Still, Lauren is right there with David at 79.8% MPF. They're both beasts. - Speaking of challenges, the negative: The omega to David's alpha, the Wardog has finished 11th, 12th, and 11th in his three individual IC attempts. That's the recipe for a catastrophically low 13.5% MPF, which, if he had one more challenge under his belt, would easily outpace Bruce Kanegai for the lowest MPF in a single season, ever. But not to worry, it probably won't last if Wardog sticks around for a while, and there's no reason to think he can't. For example, if Wardog finishes dead last in a challenge with seven competitors (F7 RC and/or IC), that would raise his season-long MPF score. Same for any individual challenge with fewer than seven participants. Still, it's a spectacular accomplishment thus far. Always be throwing. Gordon Holmes at XfinityTV.com: "Pilot Season"
Dalton Ross at EW.com: "Tribal Council goes bonkers"
Stephen Fishbach at People.com: "The Survivor Season Goes Haywire at One of the Wildest Tribal Councils Ever"
Andy Dehnart at Reality Blurred: "An insane Survivor Tribal Council had alliances and plans crumbling before our eyes"
Rob Cesternino & Stephen Fishbach at RHAP: "Know-It-Alls | Edge of Extinction Episode 9 Recap"
Rob Cesternino at RHAP: "Teresa 'T-Bird' Cooper Recaps Episode 9 of Survivor: Edge of Extinction"
Andy & Emma at The Purple Rock Podcast: "Edge of Extinction Episode 9: Y'all Making Me Crazy"
Dom Harvey & Colin Stone at The Dom & Colin Podcast: "[title tk] -- Episode 9 Recap/Analysis"